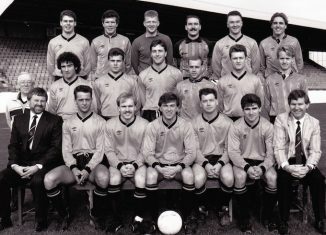 Micky Taylor stayed for one more season — 1988-89 — which saw Southport again finish 14th in what, with new sponsors taking over the N.P.L. partway through, had become the unattractively titled H.F.S. Loans League. The season fell into three distinct phases; a dismal opening two months, a dramatic improvement with a burst of national media attention and a return to mediocrity. In an attempt to rectify the early scoring problems — at one stage 292 minutes passed without Southport registering a goal — the club managed to acquire the services of the burly but skilful target man Bobby Thomson from Middlesbrough who, at 33, brought a wealth of experience. Yet the player who made the real difference arrived unheralded on October 19th from Prescot Cables. Clint Neysmith, a coloured youngster from Liverpool, scored twice on his debut and by Boxing Day had netted 11 in 8 games; but it all ended just as suddenly when he broke his leg at Goole on February 18th and subsequently disappeared back into obscurity. His final tally was 16 goals in 19 League and Cup games. Neysmith was unfortunately ‘cup-tied’ when he arrived and so missed out on the season’s main story. Home victories over Penrith, Harworth Colliery Institute, Bangor City and Tow Law Town brought Southport to their second appearance in three seasons in the first round proper of the F.A. Cup. The added bonus this time was their immediate selection for the B.B.C. Match of the Day programme, just 20 years on from the Swindon Town game. in excess of the official 3,434, provided a more tangible return. Hard on the heels of this fixture came the sudden unexpected departure of club Secretary Peter Williams in circumstances which raised more than a few eyebrows; the press release discreetly announced his ‘retirement’ after more than five years in the post. He was succeeded by Roy Morris, a Southport fireman, who was to surpass this period in office by some margin. The closing weeks saw another goalless sequence — this one lasting 399 minutes — and when the season ended Mick Taylor abruptly left to take over at Fleetwood Town.